Hey all. I was a tri-sport varisty athlete my junior year of high school; volleyball, basketball, and soccer. My true love was for basketball, and I was determined to play in college. The summer before my senior year, I was at an AAU tournament when I went up for a block, came down and turned to go get the rebound when the toe of my left shoe got caught on the floor. I felt my knee slide out of place and I froze. When I got off it it slid back into place and the burning started. I tried to play on it the next day, but that didn't work out. So I got a hamstring graft reconstruction with a tiny bit of medial meniscus removed. I had missed volleyball season, but I was determined to make it back for my senior basketball season. I did, and was cleared at three months to play again. About the same time I signed with a division one program to play basketball. I got back into the swing of things and was playing comfortably again. About a third of the way into the season, we were playing our rivals on a Friday night. I was driving to the basket and was out on my left leg when two girls hit me from the inside and behind. My knee buckled outward and I collapsed in worse pain than my first injury. I played the rest of the season, with one more minor buckling episode, until the last game. I landed awkwardly on my knee and it twisted, sending me out of my last game. I went to my doctor and asked for an mri. The results came back with a torn acl and complex torn lateral meniscus. I was blown away. I was expecting just meniscal damage, not another torn acl. I basically went into denial during the four week wait until surgery. I pushed it to the back of my mind. The day of the surgery I was so anxious. 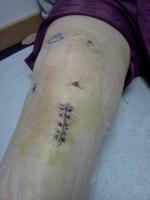 I ended up getting a patellar graft, a total lateral meniscectomy, and another tiny piece taken off the medial meniscus. I woke up in so much more pain than the last, and continued to be in more pain for the next few days. In addition to more pain, with this surgery I also had to deal with emotional problems that weren't present in the previous surgery. Starting a couple days after surgery, I began experiencing sudden intense anxiety and sudden severe sad moods. I had to go back to school less than a week after surgery, so I tried to push it off and settled into a depression. Now that school is over, the moods are slowly getting better. I asked my surgeon about them, and he attributed them to stress. It was only after I talked to my regular doctor that I learned that the emotional side effects are common after surgery. Rehab is a lot slower this time, and a lot more frustrating. I really want to be able to play next year in college, and I'm worried about how my knee will hold up, and if it will stay healthy for the next four years. Has anyone had experience with either the mood issues after surgery, or returning to a highly competitive level of sports after surgeries like mine? Thanks for any insight you can give for either.